Bikes for sale, bike parts for sale, bicycles for sale ads in Sydney. Thank you for visiting our free advertising website Bikes for sale, bike parts for sale, bicycles for sale, Sydney section. We provide high response free classifieds and free advertisement. Use our online free Bikes for sale, bike parts for sale, bicycles for sale classifieds placement system to find, list, offer Bikes for sale, bike parts for sale, bicycles for sale online! ZiPPiZAP balance bikes are superduper training bikes that help toddlers as young as 18 months learn to ride on two wheels. 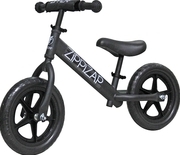 The ZiPPiZAPs amazing design teaches the rad skills of leaning, balancing, and steering without the confusion of pedals or training wheels. The ability to have their feet on the ground builds awesomeness, eliminates fear and allows kids to move at their own pace. Our hoverboards are the best and safest in Australia! Don't settle for cheaper, inferior products - DeLorean Hoverboards are affordable AND manufactured to our own standards using only Samsung components. Hoverboards are amazing fun, a great core workout and brilliant for improving coordination and balance. I am selling my Specialized Roubaix SL4 Pro/Expert with ENVE SES 3.4 Wheelset. I say PRO/Expert because it is an 2014 Expert bike, with PRO Dura-Ace drive train. Outside of tune up and test ride in the parking lot... this bike has NOT been ridden. Less than 20 miles on this baby! This is an amazingly fast and comfortable bicycle that will perform above and beyond on any hill, turn, sprint our tour you throw at it. For sale is a mint condition, barely used 1995 Lotus 110 Bicycle. The bike is in very good condition, no dents or any damage. This bike belonged to my grandfather who bought it back in the 90s brand new and never ridden it. The bike was kept in a glass cabinet (made by my grandfather specially for this bike) until now. Cruiser Bikes serve you with Combination of comfort & broad Tyre safety while giving an elegant look to rider. We are authorized dealer of Cruiser Bikes Sydney and we commit to never compromise safety and performance standards. http://www.torinomotorcycles.com.au/index.php?option=com_catalogue&view=category&id=3. 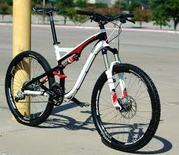 Specialized Comp Carbon 29er, size medium for sale. The bike was just tuned by my LBS (receipt available). Bike weighs 26 lbs on my digital scale.So it has seen a moderate amount of use and is in excellent condition. The frame looks almost perfect. The fork stanchions are flawless. The bike still has all the stock parts. De Rosa 3THL Triathlon 2010 Frameset Frame Aero Carbon Monocoque Fork 3THL Carbon Aero Headset Campy Integrated Seatpost De Rosa Integrated MAST Front Derailleur Braze-On Required BB Type 70mm / Italian Frame Weight (appr.) 1350 grams. Frame sizes ...........15", 15.5", 16", 16.5", 17" Frame tubing ..............Kona Clump DH 7005 Aluminum, 7" Travel Rear Shock ...........Marzocchi Roco Coil R (8.5 x 2.5 15=350lb, 15.5=400lb, 16=450lb, 16.5=500lb, 17=550lb) Fork ........Marzocchi 66 RCV 180mm w/20mm Dropouts Headset . Bike Shopping Ltd is one of the Best Selling Bike Distributor.We are Legitimate registered Company under licensed number(RC55724).We ship via UPS, and your ordered items will get to your door step within 48 hrs(Two Working Day).We sell all kinds Cannondale, Cervelo, Ellsworth, Giant, Jamis, Klein, Kona, Litespeed, Rocky Mountain, Santa Cruz, Specialized, Trek, Gary Fisher bikes. Blue Competition Cycles AC1 SL - 2011..1, 650usd Blue Competition Cycles AC1 - 2011.. 1, 300usd Cervelo Cervelo - 2011 S1 .. 1, 250usd Cervelo - 2011 S2 .. 1, 950usd Cervelo - 2011 S3 .. 3, 100usd Cervelo - 2011 R3 .. 2, 050usd Cervelo - 2011 RS .. 1, 900usd Cervelo - 2011 R3 SL .2, 350usd Cervelo - 2011 S3 Olympic Edition. This bike CANNONDALE Comes Brand New in the Original box with all Original Directly from Sony accessories warehouse. Be the first one to Have this great device. Here Are some of Our Best Offers quoted in United State Dollars (USD): 2010 Cannondale SuperSix Hi-MOD Ultimate SRM 1400EURO ======== 2010 Cannondale Carbon Ultimate Flash Mountain Bikes XC Race = 1550EURO 2010 Cannondale SuperSix HI-MOD 1 Road Bike 900EURO ========= 2010 Cannondale Carbon Ultimate Flash XC Race Mountain Bikes:: 1000EURO RZ 2010 Cannondale Bike One Twenty 3 750EURO :::::::::::::: 2010 Cannondale Bike Grey CAAD9 5C 800EURO :::::::::::::::: 2010 Cannondale Bike ::::::::::::::::::::::::::: 450EURO CAAD8 6 NEW 2009 Cannondale Rush Carbon 4 Bike = 1000EURO NEW 2009 Cannondale Rush 6 Bike = 1100EURO NEW 2009 Cannondale Caffine F1 Feminine Bike = 900EURO NEW 2009 Cannondale Road Tandem Bike = 1. Dear Customer, BIKE BASE LIMITED is one of the Best Selling Bike Distributor.We are Legitimate registered Company under licensed number (06489857). We have a promo going on now on our best offer, We ship via UPS, and your ordered items will get to your door step within 48hrs(Two Working Day) We sell all kinds Cannondale, Cervelo, Ellsworth, Giant, Jamis, Klein, Kona, Litespeed, Rocky Mountain, Santa Cruz, Specialized, Trek, othman cole storebikelimited@live. Price Catalogue. 2011 Rocky Mountain Element 50 MSL.$2, 500 2008 MARIN Juinper Trail Bike ......$1200 2008 MARIN Wildcat Trail Bike ......$1, 200 2008 MARIN Alpine Trail Bike ......$1, 300 2008 MARIN East Peak Bikw ......$1, 550 2008 MARIN Rock Springs Bike ......$1, 300 2008 MARIN Rift Zone Bike ......$1, 400 2008. It’s unfortunate that I need to part with this exceptional bike. Up for sale is a 2008 Bianchi Ducati Corsa 900XR Bike. It is brand new - it has never been ridden! Specs: Brand: Bianchi Model: Ducati 900XR Model Year: 2008 Frame Size: 53 cm Complete Bike/Frame: Complete Bike Weight: 15lbs 3oz Frame Material: Ducati TC07-CARBON XLIGHTL Fork: Ducati Full carbon straight Headset: FSA Integrated Front Derailleur: Campy Record 10 Speed Rear Derailleur: Campy Record 10 Speed Brakes: Campy Record 10 Speed Shifters: Campy Record 10 Speed Crankset: Campy Record 10 Speed, 39/53, 172. Australia free ads for Bikes for sale, bike parts for sale, bicycles for sale, Sydney, Bikes for sale, bike parts for sale, bicycles for sale free ads Sydney, Bikes for sale, bike parts for sale, bicycles for sale for sale Sydney, Bikes for sale, bike parts for sale, bicycles for sale to buy in Sydney. Find on this page free classifieds for Bikes for sale, bike parts for sale, bicycles for sale in Sydney. This listing includes classifieds for sale and to buy in Sydney. FREEADSAustralia Sydney offers you a platform to post free advertisements or classifieds for Bikes for sale, bike parts for sale, bicycles for sale in Sydney. FREEADSAustralia helps you search, find buy, sell, rent or hire in various categories like apartments, goods for sale, local services, cars , jobs and many more in Sydney. If you posted an advertisement in category Bikes for sale, bike parts for sale, bicycles for sale of FREEADSAustralia Sydney before please use Edit my ads button to change or cancel your ad. Bikes for sale, bike parts for sale, bicycles for sale Sydney ads Sydney, Bikes for sale, bike parts for sale, bicycles for sale classifieds Sydney, Bikes for sale, bike parts for sale, bicycles for sale free ads Sydney, ads for sale Sydney, ads to buy Sydney, FREEADSAustralia. Find here ads for sale, to buy and rent in Sydney. Goods for sale in Sydney, vehicles for sale in Sydney, Sydney real estate for sale, Sydney property for sale, property for rent in Sydney, business ads in Sydney, Sydney business classifieds, services in Sydney, Sydney services ads, jobs in Sydney, pets for sale in Sydney, Sydney dating, Sydney cars for sale.